Ok it seems I am obsessed with making these mat bags. I have so many ideas. I simply have to make time to sit down and cultivate a Nike like attitude. Ok so I have been making Yoga Eye Pillows for about 8 years and have always wanted to make yoga mat bags as well. This past weekend I practically had the house all to myself and I had been promising myself that I would sit down at the sewing machine (have I mentioned I hate my sewing machine….yea thats another post (aka Rant) for another day) and try my hand at Mat bags. Just a little back ground, I am a fabric whore, it’s probably the only really girlie thing about me, I dont have um-teen-million pairs of shoes and I dont do my nails, religiously ( hi Kristi :). But aint fabric just pretty. And you can do soooo much with it, artsy fartsy stuff and practical stuff too. Which is why I don’t get my nails did on a regular basis, it’s not practical. But honey I can go to Hancock fabrics and drop a couple of Hamilton’s on fabric and assorted embellishments and not give it a second thought. For the mat bags I like a stronger fabric, not unlike what you would use for upholstery, but not quite as stiff. I also use a lot of old jeans, they can be cut up and used for all kinds of projects like quilts. I have even made paper from blue jeans. I started with a real pretty white and blue cloth with almost a paisley look to it. I cut a rectangular shape about 19″ x 30″ and ran a quick 1/4 in hem around the whole thing. 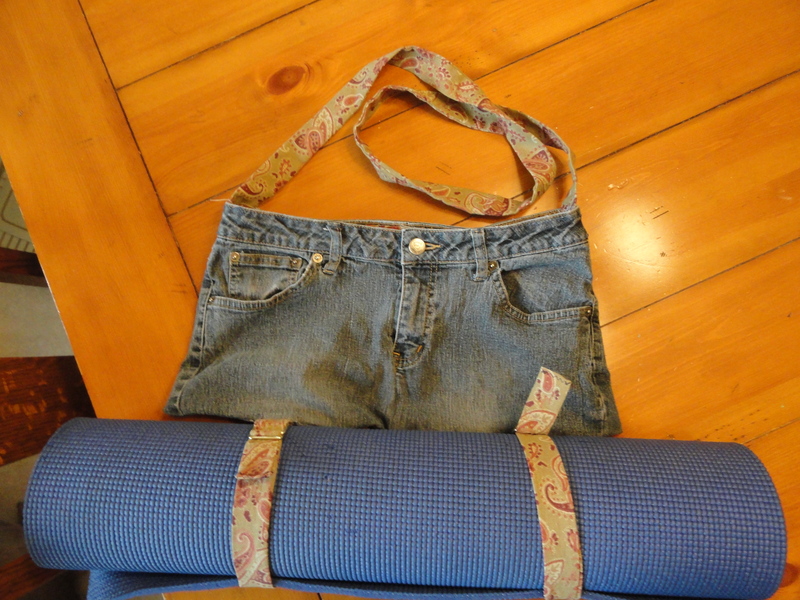 Then cut up an old blue jean skirt to make the pockets on the outside of the bag. The piece was 19″ wide but only about 16 in high. I sewed it to the bottom of the rectangle and then sewed a dividing line up the center to make 2 pockets. Next I took a piece of the white and blue cloth it goes almost all the way around the Jean material but only about 10 inches up, making another outside pocket. I cut a circle from the same white & blue cloth and sewed it to the bottom, attached a long strap made from the main cloth and voila! A mat bag. I made this bag a little longer than I will in future bags. I like a bag that hangs across the chest and over the shoulders,so the strap needed to be a bit on the long side. Plus making it longer (deeper) means my mp3 case fits right on top. I will have to change a few things about the basic construction. The outside pockets need to be wider, for example, if the main bag is 29 in wide then the pocket fabric needs to be about 4 inches wider than that. So that when you sew it on, making sure the edges meet, that allows the pockets to gape open enough that you can actually put something in them. But all and all I like the way it turned out, for a proto-type.